Alrighty then. 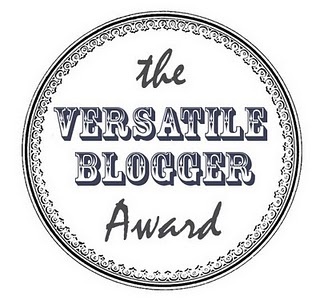 I was notified by my friend CJ on Sunday night that she nominated me for the Versatile Blogger Award. I’m very honored at the award. Basically, it means that someone considers my writing of a certain quality, and wants to recognize that and share with others. I am very humbled, and pleased, that she thought of me. Thank you, CJ, for your kindness and thoughtfulness. It means a lot to me. You can find CJ over at DYSB Writing. She has come a long way since I first met her in January, and I am very happy to call her ‘friend’. I hope you check them all out. As for my seven things, hmmm. 1. I have a very torrid love affair with…music. It’s terrible. I’m horribly addicted. Been to therapy, trust me, there’s nothing that can help me. 2. Richard Armitage is a beautiful man. Don’t even argue that with me. You’ll never convince me he’s not. 3. I love order. I like things to be in their place and for things to look nice and neat. 4. I have kids. I am still trying to accept that number 3 is not going to be a permanent reality. 5. I have trouble admitting my deepest feelings, and feel that when I do, people think I’m being insincere. I usually mean what I say when I tell you what I’m thinking or feeling. 6. I love the theatre! I love plays and musicals and opera and ballet. I am finally getting to go see a Shakespeare play (The Tempest) performed live in a couple of weeks. I cannot wait! and, just for kicks, an extra. I can be a terribly big flirt. *smiles innocently*. You are a beautiful and talented person. Keep reaching for those stars. You will reach them. And I am more than happy to propel you out of your comfort zone.